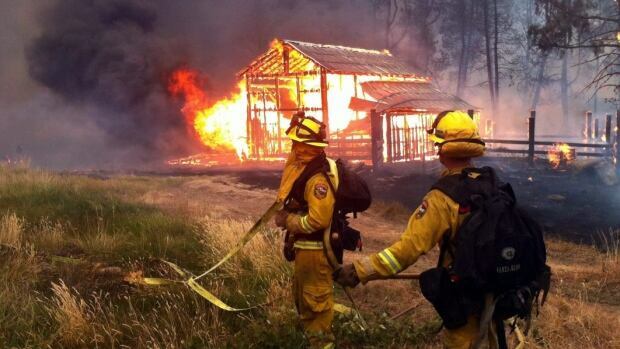 California wildfires force thousands to flee fast-moving flames. An explosive wildfire raced across several rural communities in Northern California, charring more than 155 square kilometres over a matter of hours, chasing thousands of people from their homes and sending four firefighters to the hospital with second-degree burns. The fire erupted in Lake County, about 160 kilometres north of San Francisco, Saturday afternoon and rapidly chewed through brush and trees parched from several years of drought, the California Department of Forestry and Fire Protection said. An unconfirmed number of structures were destroyed. Entire towns as well as residents along a 56-kilometre stretch of highway were evacuated. The firefighters, all members of a helicopter crew, were airlifted to a hospital burn unit, where they were listed in stable condition, department spokesman Daniel Berlant said. To the east, firefighters battled a blaze about 113 kilometres southeast of Sacramento that exploded to more than 262 square kilometres in four days, turning the grassy, tree-studded Sierra Nevada foothills an eerie white. Crews increased containment to 20 per cent by early Sunday. The fire, which broke out on Wednesday, destroyed 86 homes, 51 outbuildings and was threatening about 6,400 more. "I lost my business — it's all burned up — my shop, my house, 28 years of living," said Joe Thomas, who lives near Mountain Ranch. "I got to start all over. It's depressing." A choking fog of smoke and ash turned California's grassy, tree-studded Gold Country an eerie white. Away from the burned-out cars and smouldering remains of homes, Annette Stout and other residents who fled rested at evacuation centres. "I grabbed my cats, their carriers, important papers, my husband's death certificate and his ashes," said Stout. California Governor Jerry Brown declared a state of emergency and more than 3,850 firefighters were assigned to the blaze. Its cause is under investigation. Meanwhile, new evacuation orders were issued Saturday for the largest wildfire in the state, threatening to sweep through an ancient grove of Giant Sequoia trees. The fire, sparked by lightning on July 31, has charred 521 square kilometres according to the latest fire map released by the U.S. Forest Service. In a fight to save the trees, firefighters cleared brush around the Grant Grove and set prescribed burns to keep the flames from overrunning it. By Saturday, the threat lessened when it became clear the backfiring and monitoring efforts helped protect the treasured trees, the Fresno Bee reported. The grove is named for the towering General Grant tree that stands 82 metres tall. There are dozens of Sequoia groves in the Sierra Nevada, and some trees are 3,000 years old.